A subscription costs $44.99 per year. 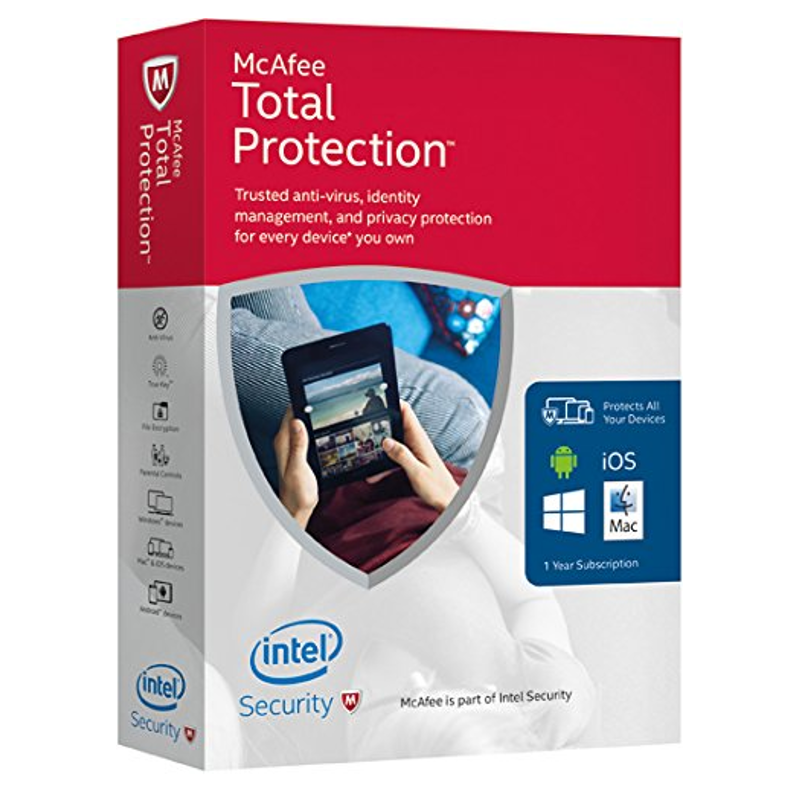 McAfee Total Protection is basically a combination of McAfee AntiVirus Plus, McAfee Internet Security, and a few extra features. With all this you would expect to cost more than the products it is made up of, but it doesn't, it actually costs less. 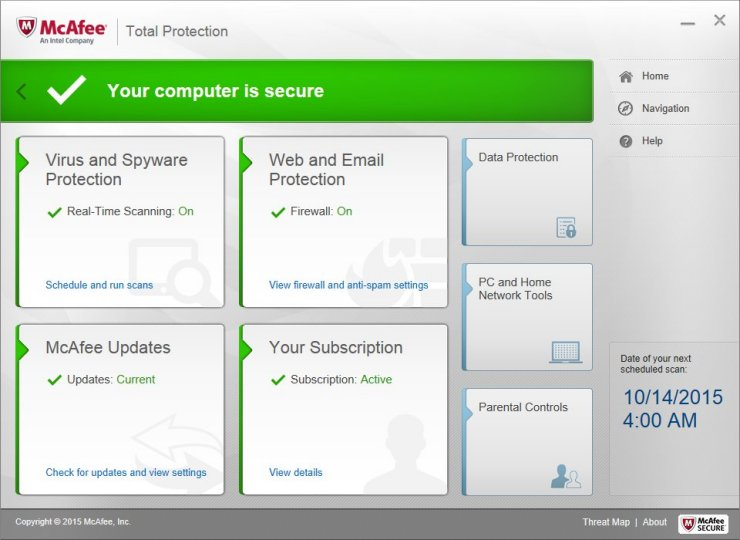 McAfee Total Protection is a relatively new product by the security software company McAfee and with all the features they have packed into it, along with the ability to protect all of your devices (Windows, Mac, iOS, and Android), McAfee is serious about bringing good value to it's subscribers. First and foremost the most important feature of any Internet security product is the anti-virus software it comes with. McAfee has been making anti-virus software since 1987 so they have a lot of experience on how to best protect electronic devices. As always their anti-virus software ranks high in all the key areas. It doesn't use much resources when scanning, it is quick, and it has a very high detection rate for viruses and malware. During our test this year it was able to find all 10 viruses on our infected Windows test PC and remove them without any problems. The anti-virus software not only protects your digital files but it scans your downloads and emails as well so no virus will ever be able to reach your computer, let alone infect it. You can also forget about those spam emails as well since the included anti-spam filter will keep your email inbox clean and tidy. Even when you are surfing websites the virus scanner is working silently in the background making sure the sites you visit are safe places and do not contain any malicious code. Your family is not forgotten with McAfee Total Protection. It includes parental controls so you know your kids are safe when they are surfing the internet or downloading the latest game. You can control what your children see and do, and you will get an email report about it every week. Windows PC owners are able to encrypt their personal files. This can include anything from word documents to photos. Allows you to check the security status on all of your protected devices via a web browser. With the console you can also remotely locate, lock, and wipe your lost or stolen tablet or smart phone. True Key Identity Manager is included with McAfee Total Protection and is used to safely store all of your user names and passwords. It also allows you to quickly and easily log into web sites and apps, on your computer and phone. Multi-factor authentication is also possible along with facial recognition. The File Shredder allows you to permanently delete your digital files. Deleting files normally on your PC just deletes the file location information. The actual file contents still exist until they are written over by a new file. McAfee's File Shredder solves this problem by actually writing over the file you want to delete with random characters to permanently delete all of the information. Android tablets and phones have a few additional features included with McAfee Total Protection. They are anti-theft, app privacy, data backup, and Wi-Fi protection. McAfee Total Protection on the Mac OS includes anti-malware detection and removal, a internet firewall, network manager, and a web safety tool. McAfee Total Protection supports Windows 7 and higher, Google Android 4.0 and higher, Mac OSX 10.8 or higher and Apple iOS 9 or higher. Not all features are available for all operating systems. 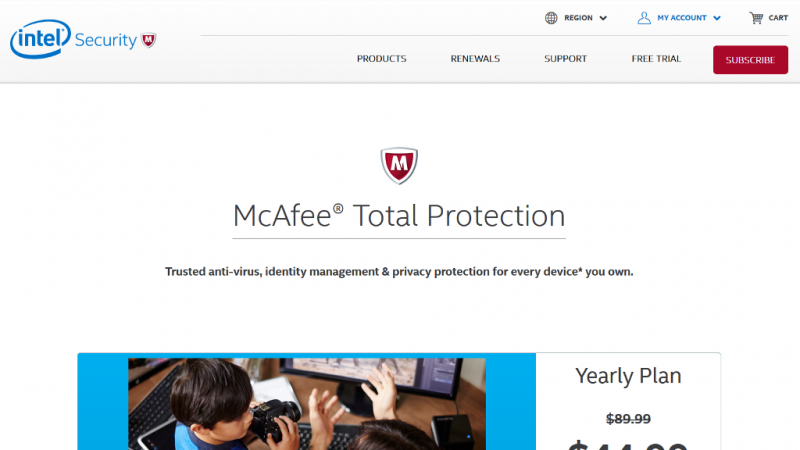 For a one year subscription McAfee Total Protection costs $44.99 and this includes protection for all of your household devices. This is cheaper than either of McAfee's separate products AntiVirus Plus and Internet Security. McAfee must want to move their subscribers to one product as it doesn't make sense to price the flagship product lower than their own competing smaller products. If for any reason you are not 100% satisfied with McAfee Total Protection, just let Customer Service know at McAfee within 30 days of purchase and you will get a full refund. All services are covered by a service resolution guarantee. If the same issue occurs within 7 days, a McAfee TechMaster will fix it for free. Depending on your problem the cost to fix it will range from $69.95 to $179.95. Customer service for all McAfee security software is very good. You can access a McAfee Expert by a toll free phone number, live chat, and email. On the McAfee Support website they have a knowledge base of commonly asked questions relating not only to their software but device security in general. You will also find a number of security related articles from experts giving advice and talking about the latest advances and threats found online. They also have detailed information about viruses themselves on the Virus Information page including descriptions, threat levels, tracking and removing tools. Finally, McAfee has a robust community forum with thousands of posts regarding their products and on topics related to online security. This is a great source of information as the community is very helpful and usually will answer any question you may have. Best price I found was on the McAfee website. Cheaper than Amazon. I have 3 teenagers with 1 in University. I have installed Total Protection on all of their laptops and my PC at home. One was Windows 7 while the rest are Windows 10 machines. Easy to do with no issues. No real noticeable drop in speed even when doing a complete hard drive scan. I have read that the McAfee firewall is better than the Windows one. Not sure if that is true but I haven't had any issues and neither have my kids who I am sure have been on "riskier" websites than me. I have always been a Mcafee person instead of Norton. Well I moved from the regular Mcafee antivirus to Mcafee Total Protection this year on my laptop and I wasn't sorry I made the change. It was actually cheaper this year to do it because of a sale I found on th Mcafee website. You seem to get a lot more toys with the upgrade. I don't have kids so the Parental controls will not be used by me but I can see where the file encryption would come in handy along with the password manager. I also have a Samsung Galaxy S6 with Android so I can install Mcafee on that for some extra protection. The Samsung phone already comes with a phone locator program but if Mcafee's is anti-theft program is better I will switch to that. Good price. I found it on sale at Mcafees website.